Continuous product development and innovation allow Blum’s range of fitting solutions to be paired with the latest kitchen and furniture designs. 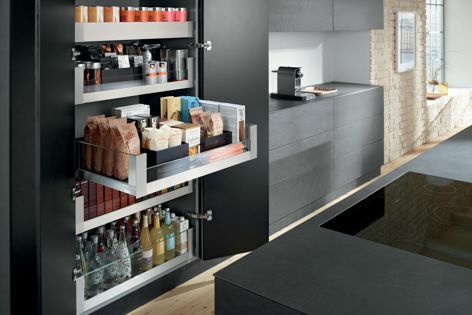 Blum’s SPACE TOWER pantry unit can be tailored to individual needs and is designed to provide clear visibility and easy access to its contents from three sides. Each product in the Blum range undergoes comprehensive durability tests, ensuring a high-quality final product. Blum is consistently developing and evolving its range so that its products can continue to be paired with high-quality kitchen and furniture designs. Keeping the end user in mind, Blum aims to deliver fitting solutions that make everyday kitchen use efficient and effective. Innovation should not only bring about functional improvements, it should also consider emotional and design aspects. Design is, therefore, an integral part of every development. Blum’s focus on innovation extends not only to its lift systems, hinges, box systems and runner systems, but also to its range of support services that can assist in the daily activities of customers such as planning, construction and ordering, along with manufacturing, assembly and marketing. All Blum products undergo a variety of comprehensive durability tests to ensure quality for the lifetime of the furniture. Ongoing quality checks are held throughout the entire manufacturing process to ensure that the products meet the high standards of both Blum and the end user. Blum also works with renowned independent testing institutes and organizations to ensure that its range of products and services meets the relevant standards and requirements. Blum’s products and convenient services are backed by years of research and development, dedicated employees and continuous efforts to identify customer needs. The insights gained from this research are incorporated into the development of new products that are beautiful to look at and practical to use. Blum has been recognized with numerous industry awards for both its quality products and its innovative designs.